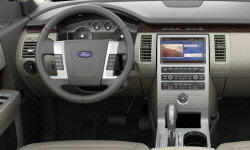 Ford Flex Pros and Cons | Page 1 of 2 | Why Not This Car? What drives people to buy (or not buy) a certain car? 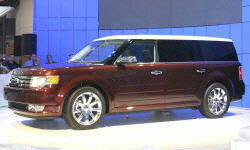 TrueDelta's members share Ford Flex pros and cons based on their real-world driving experiences. We love the styling of the Flex.Expecially like the two tone roof/body.There is nothing else like it on the road and it can hold a ton of stuff in the rear. Ride in one and you'll be sold! We've owned our Flex for 75,000 glorious miles. Two of our friends families have bought their own after seat time in ours! This is a minivan killer. My over 6 foot tall friends absolutely love my Flex because their knees never touch the backs of the front seats. The rear seat is like sitting in a stretch limo. With plenty of cup holders and storage for all to enjoy. This vehicle is very quick. Everything else we tested seemed second rate. Smooth and easy to drive in the city, but it is the ultimate family cruiser. The seating throughout the vehicle is extremely roomy. Adults can fit comfortably in both the second and third row seats. The driver and passenger seats are also extremely comfortable. This vehicle out-handled all of the vans and SUVS we shopped against it. The cornering and tracking is firm, but it absolutely smooth on the road. Sit relatively low, feel buried within a huge vehicle. I am currently averaging 20 MPG overall with heavy highway use. For the size of vehicle I think that is rather reasonable. It is a very smooth ride but feels under control and not "boaty." Very comfortable and easy to adjust front seats with good materials, good controls, and sufficient room to stretch out your legs. Truly unique, no excuses two-box design. Makes every bit of interior space usable. Large enough for my dog crates. Towable behind my motorhome. Second row seats very large and comfortable.